After successfully using FrontlineSMS in the Tomorrow is a New Day (TND) project to monitor and improve radio dramas in the Niger Delta, SFCG Nigeria chose to use the platform in a completely different capacity in Jos, a city in Northern Nigeria. SFCG Nigeria is part of Search for Common Ground, one of the first and largest conflict resolution focused NGOs. Nkhotakota Community Radio Station, along Lake Malawi, is a Malawi Communication Regulatory Authority (MACRA) recognized broadcaster and has been in operation for eleven years. More than 500,000 people live within our coverage area- transmissions reach Nkhotakota and Ntchisi districts and parts of Nkhatabay, Salima, Dowa, Mzimbaand Kasungu. Coming to you from the University of Cambridge's Centre of Governance and Human Rights, we are pleased to feature a short film about the Africa's Voices project. This research pilot project supported local radio stations to use FrontlineSMS for audience participation, in an effort to continue to enhance citizen-based dialogue. Radio is still the killer app in Africa for sharing information. Adding mobile turns a one-to-many medium into a two-way interactive opportunity, empowering people to ask questions and hold their leaders to account. According to the report, with support from the Foundation to Promote Open Society, Developing Radio Partners (DRP) launched the one year pilot project, working with three local radio stations in each country. The primary aim of Zachilengedwe Tsogolo Lathu, as the participants named it ("Our Environment, Our Future"), was to empower rural Zambians and Malawians to address key climate change issues, especially local deforestation, by improving their access to information on the subject via radio and mobile phones. A big thank you to Mike Adams, the INTL Coordinator, for sharing his experiences with FrontlineSMS and further schooling us on how radio can facilitate in saving lives! In times of disaster radio not only saves lives, it can also bring hope and critical information to the affected community. When the 2004 tsunami struck Banda Aceh, Indonesia, all the radio and TV stations went off air. Similarly, during the 2005 South Asian earthquake, the only radio station near the epicentre lost its tower and went off air. In times like these, people are in desperate need of news and information on how to get to safety and how to survive. However, the unfortunate trend seen recently is that when radio is so important, many times it goes off the air and does not come back until well after the emergency is over. Airtime is an awesome piece of software, built by Sourcefabric, which lets radio stations take control of programming via the web. It includes a simple scheduling calendar, smart playlists and automated playout. To mark World Radio Day 2013, FrontlineSMS:Radio's Amy O'Donnell wrote a post for Sourcefabric's blog on how this scheduling tool can be complemented by channels including SMS to help to make radio interactive. A snippet of the post is republished below, or you can read the original post in full here. I’ve been volunteering with the FrontlineSMS:Radio project and recently had the pleasure of speaking with Colin Spurway of BBC Media Action, an organization which helps people around the world to harness the media to promote change in their communities. Colin is the Project Director of Loy9(pronounced ‘Loy Pram-booun’), a multimedia initiative in Cambodia geared towards encouraging youth participation in civic life through the use of a television series, phone-in radio shows, online discussions and roadshows. We had a great discussion about the significance of the Loy9 initiative in promoting youth engagement in civic society through mobile technology, as well as some of the challenges. For the past month, I’ve been in Sudan working to set up the information flows and tech that will support SUDIA’s Community Communications System. From the tech and information management perspective, SUDIA’s System is interesting because it adapts to a low tech environment by integrating SMS and radio, and processing information largely offline. The System collects and disseminates information useful to communities that live along the migratory routes in Blue Nile State. It focuses on information that communities themselves can use to make their livelihoods more sustainable and more peaceful. In other words, the System is not aimed at organizations (Government or non-Government) that can use information to provide services or design interventions. Rather, it is aimed at communities helping themselves, and provides information that is useful to community leaders in organizing local community responses to livelihood challenges. The Rockefeller Foundation recently launched a new website, Capacity to Innovate.org, which examines lessons from a number of organizations including Ushahidi and Internews, and encapsulates them in three short reports which are well worth a read. FrontlineSMS is featured in the 'Learning From Experimentation' report, available from the website. Here's an excerpt, but we really recommend the whole report as a very readable and thought-provoking set of examples. FrontlineSMS is coming up to 7 years old in October 2012 - seven years ago, our Founder Ken Banks made the first, prototype version available for download. We're celebrating this milestone by highlighting the people we work for - our wonderful users. That's you, folks. See a slideshow of our users showing off their work here. To kick us off, our FrontlineSMS:Radio Project Manager, Amy O'Donnell, highlights one of the many radio stations using FrontlineSMS - Rite FM, in Ghana. You'll hear more from our team, including Ken, in the next four weeks, as we highlight more of the incredible work done by people using FrontlineSMS around the world. RiteFm: We Promote Agric & Social Development in celebration of FrontlineSMS 7th birthday... send in your photo with what you use FrontlineSMS for. 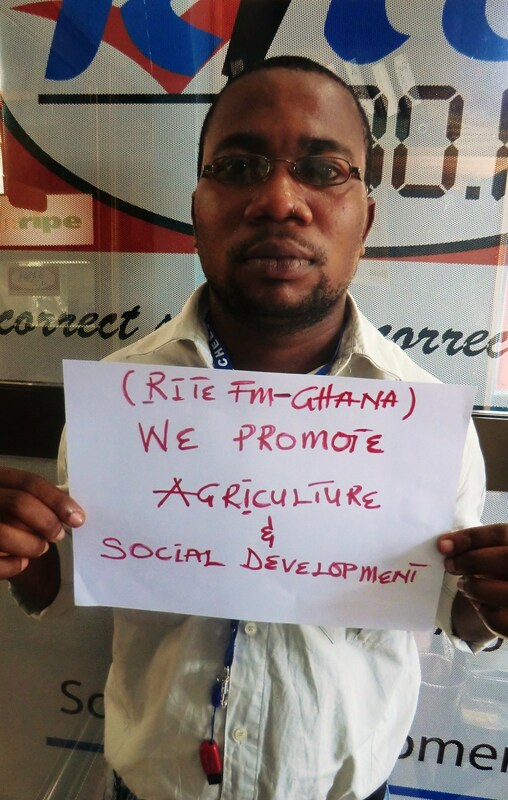 Rite 90.1 FM is a radio station in Ghana which focuses on agriculture and social development to inform and educate local farmers. They take the lead from their audience, using SMS, and make sure their shows are responsive and relevant to their community. This use case, for me, also shows how SMS participation empowers communities to seek information vital to their livelihoods. The catchment area of Rite FM is diverse, with both rural and urban populations in the Eastern Region each having their own unique challenges, so it's important to make sure programming is participatory and responds to local needs. This is why presenters, including Ike Obufio (photo above) use FrontlineSMS to encourage listeners to share their farming experiences via SMS. The audience are invited to text in their opinion to polls on the major causes of food insecurity or add their voices to debates on industrialized farming techniques and genetically modified foods. Starting today, we're collecting photos of our users telling the world how they use FrontlineSMS. If you want to get in on the act, take a photo of yourself or your team holding a piece of paper or a whiteboard telling the world what you do with FrontlineSMS. For example: 'I monitor elections', 'I safeguard children' or 'I make art'. You can see a slideshow of the photos we've had so far on our Flickr page. It doesn't matter what language it's in as long as it's legible and if possible you should be able to see from the photo where it was taken, so, if you can, get out of the office! On August 29th 2012, balancing act featured Amy O'Donnell as she introduced FrontlineSMS: Radio to the world and how SMS is changing the way media houses interact with its listeners. Thanks balancing act for this great piece! As TV and radio broadcast markets intensify across several liberalized African countries, broadcasters need to find solutions to create more interactive communication with their audiences and build loyalty among them. SMS is one of those. There are a few SMS management software available out there butFrontlineSMS, a rather discreet solution provider has already been in the front line to support several African broadcasters. Sylvain Beletre, Senior Analyst, Balacing Act talked to Amy O'Donnell, Project Manager at FrontlineSMS on how SMS can be a very powerful media tool. Looking at recent audience surveys across the African market, it is obvious that local audience want local content. Indeed, radio and TV operators have responded by increasingly shifting from a one-way broadcast to media that reach audiences by integrating interaction with listeners into programming. But the lack of communication with the audience and the lack of finances are often major barriers for broadcast organizations working in African countries. Not knowing exactly what people want to watch and listen and not being able to check facts on the field, broadcasters have to find alternative solutions to make their job easier if they want to avoid being eaten up by more powerful competitors. And if broadcasters do not know their audience's program needs, they lose market share together with potential advertisers' revenues. As we continue to follow the progress of radio stations taking part in the trial of FrontlineSMS:Radio, Tully McLoughlin offers an update from a radio station from Ghana called Rite FM. Through Farm Radio International, who help African radio broadcasters to produce better farmer-focused radio, Tully has been working closely with Rite FM as they have explored the use of FrontlineSMS:Radio in a trial phase. The new software is a customized version of our free and open-source software tailored for radio presenters and station managers. Rite FM are also taking part in the Africa’s Voices project as part of academic research from the Centre of Governance and Human Rights at Cambridge University, UK to explore how radio stations are using ICTs to engage listeners in discussions on development and governance issues. Here, Tully shares how SMS is a crucial part of the listeners' toolkit and "may be the only way they will contribute." Rite FM broadcasts on 90.1 FM and online at www.ritefmonline.org from the bustling, 20,000-resident town of Somanya in the Eastern Region of Ghana. It occupies a unique niche of the radio space here – a commercial station for agriculture and social development. It is not simply an outlet for agricultural extension, nor do its programs present the standard rigmarole of music, politics, and religion. The catchment area, which includes portions of the urban Greater Accra region and large swaths of rural area in the Eastern and Volta regions, symbolizes that dual-demographic challenge. I’m volunteering my time at Rite FM. I met the director of the station through their close partnership with Farm Radio International, an NGO with whom I work. Farm Radio was started in the late 1970s by a Canadian agricultural broadcaster who saw the need for better farmer-focused radio in Africa. The organization has been supporting commercial, public, and community stations on the continent since then, and in 2007 undertook the 42-month “African Farm Radio Research Initiative” with the support of the Bill & Melinda Gates Foundation. Rite FM was one of five Ghanaian stations in the project. My phone buzzes on the table by my bed, waking me up. “Tully. Owuraku wants you to talk about the Africa’s Voices project on the Morning Show in one minute.” That’s Kofi Baah, called Granpaa, the show’s producer. It’s July 20th, 7 am. Asamoah is devoting today’s show to a discussion of food security in Ghana, inspired by this month’s question for the project. The Africa’s Voices project is being undertaken jointly by the teams at FrontlineSMS:Radio and the Centre of Governance and Human Rights at Cambridge University UK, and Asamoah is taking the opportunity to cover the issue. The question asks: “According to you, which is the bigger threat to food security in your area?” The options are: climate change, land access, market access, and food prices. I explain that by texting in their opinion they stand to win a remote-control, solar-powered, two-in-one lantern radio. A perfect way for farmers, in the field and off the grid, to tune in, the station’s director had told me the day before. Asamoah takes calls and guides the conversation as it drifts from a debate on industrialized farming techniques to genetically modified foods. He is a pro at making the programming interactive. Beyond his demeanor, he has a number of tools at his disposal. There are two phone-in lines; an additional four lines on the Freedom Fone, an Interactive Voice Response tool; and an all-network SMS short code provided by the SIIMA system of SMS GH, a SMS-solutions company in Ghana. In addition, Rite FM operates its own website. And of course there is the battery of social outlets: a Facebook and user profile (ritefm), and a twitter feed (@rite901fm), and various satellite websites for other Rite FM projects. Now, the introduction of FrontlineSMS:Radio as part of the trial adds another exciting tool to the mix. The advantage of this arsenal is that listeners participate and hosts facilitate in the way they’re most comfortable. Callers pepper the Morning Show, which runs from 6:30 to 9am, and The Drive, which runs from 2 to 5:30pm. But for shorter programs like Time With the CEO, profiling senior executives of agricultural businesses to showcase models of success and affluence along the agricultural value chain, and Women in Agriculture, focusing on the role of women as wives, mothers, traders, and entrepreneurs, the host may not be seeking a spread of opinions. SMS, and to some extent Facebook or Twitter, give the host the flexibility to incorporate certain comments fluidly. That means, Asamoah points out, “Even when I’ve not gone on air, I can respond to you.” For listeners, says Nii Alarbi, a reporter and broadcaster for the Rite FM news team, SMS may be the only way they will contribute. “It’s not everybody who will like to call in for other listeners to hear his or her voice.” On a good day, a producer might expect to receive 10 or so texts in a show. To find out more about Cambridge University's Centre of Governance and Human Rights "Africa's Voices" project click here and to learn about other projects using SMS with radio, visit FrontlineSMS:Radio's website. Interview with European Journalism Centre Magazine: Is FrontlineSMS:Radio Advancing Social Change in Africa? Q. How has FrontlineSMS technology influenced African media? Exponential growth in use of mobile technology has meant that many African media outlets are interested in using this technology effectively. By downloading FrontlineSMS and plugging in a mobile phone or GSM modem to a computer, people can use SMS in more sophisticated and professional ways. We are moving from having contributions fed via SMS into an individual’s phone to a more open way of integrating SMS into content. We’re also supporting citizen journalists with tools for digital news gathering. In Zambia, for example, Breeze FM radio uses FrontlineSMS to communicate with journalists. After gathering news tips received from the general public, the radio station organizes the evidence, sends SMS to journalists who may be out in the field, encouraging them to verify the facts and report. Q. What is innovative about the FrontlineSMS software plugin? With Version 2 recently released, FrontlineSMS has a user-friendly interface making it easier to manage larger volumes of messages, and to customize the software to better meet user needs. Pending messages can be sorted in a more timely fashion. Read more on the FrontlineSMS:Radio blog. So radio is important—but not perfect. Although community radio stations often involve local residents in programming and long-term planning, getting real-time feedback from listeners can be challenging. Voice calls are expensive, and stations have a limited time to take calls from their audiences. This is where mobile telephony and text messaging can be a game changer, transforming radio listeners into active participants. Another example: FrontlineSMS, an organization devoted to leveraging mobile phones for development. Unlike similar organizations, Frontline has devoted significant resources to radio initiatives. Frontline’s platform has been used by community radio stations like Radio Mudzi Wathu in Malawi, which uses Frontline SMS to solicit questions, comments, and ideas from listeners. During prime listening hours, Radio Mudzi asks its audience questions like “why do you think that HIV/AIDS is increasing despite interventions?” and asks them to text their responses. They then aggregate the responses, analyze them, and take them to local policymakers and aid workers. In addition to facilitating audience participation, SMS-oriented radio initiatives allow for unprecedented levels of audience research. After receiving feedback on any given issue, stations have a repository of information that they can analyze and look back on in order to better serve needs of audience. As they identify trends, needs, and concerns, radio stations can catalyze a profoundly fruitful cycle, using more relevant programming to drive audience engagement, thereby soliciting more feedback and dialogue. So how can we encourage more hybrid radio/mobile projects? First of all, we need to adjust the way we approach technology intended for the developing world. When designing, funding, researching, or discussing technology for development projects, we need to stop being fixated on one technology or platform and instead consider how new technology can be integrated with existing needs, values, and networks. Better FM was created in 2008. Despite the fact it's a relatively new station here at Fort Portal, it seems very successful in terms of audience and reach. It has a high degree of response from local politicians, who are keen to engage with local citizens and hear their feedback. Honourable Alex Ruhunda, Member of Parliament for Fort Portal Municipality, District councillors and Tooro Kingdom officials regularly frequent the studios. Better FM has several programmes which focus on ensuring more transparency and accountability on public service delivery, especially concerning procurements and the building of infrastructure, particularly road, electricity and water. One programme is called 'Know your leaders' which offers an opportunity for listeners to interact with their community’s decision makers. Another is called the ‘Listeners’ Forum’ and is sponsored by a local organisation called Tooro Development Network who specialize in empowering grass root organizations with ICTs and promoting transparency. Both shows are hosted by Better FM presenter Wilfred Mukonyezi, and have a heavy emphasis on being interactive with the community. Wilfred takes around 10 calls during each show and usually receives around 50 SMS, some of which are read on air. For the past two weeks the station had a technical problem with their internet provider meaning they were not able to receive text messages. On 19th April, we installed FrontlineSMS:Radio – which does not rely on internet connection - on the studio's computer, and Wilfred was really excited. We played with the software for an hour in order to get more familiar with it; sending text messages and testing functionality by creating imaginary polls. Wilfred immediately created "shows" for all his colleagues, a functionality in FrontlineSMS:Radio which allowed him to set up a space for each presenter to manage SMS relevant to them within the same system. After two weeks without SMS, Wilfred is glad he won't have to depend on the internet to receive messages any more. He said "All my workmates will enjoy this software! It's cheaper, it's easier, and [unlike relying on an internet connection] it doesn't give me a headache!" Whilst FrontlineSMS is well known for being used in low infrastructure environments with little or no internet access and limited smart phone availability amongst audiences, we often hear cases of the software being used in contexts to complement many other technology options available. While Amy and I were in Cambridge in the UK a few weeks ago visiting colleagues at Cambridge University’s Centre of Governance and Human Rights, we also had the pleasure of dropping in to visit Cambridge 105, a community radio that broadcasts live across the city 7 days a week. The station is a not-for-profit organization that draws on its wide range of volunteer members for all aspects of production throughout the day. Cambridge 105 actively uses social media tools such as Twitter and Facebook as part of their audience engagement strategy. They are also using FrontlineSMS in a very innovative way in order to help listeners interact with the presenters using text message. Audience participation is popular at Cambridge 105, particularly during the breakfast and drive-time shows. Axel Minet (photo right), who works at the station, described how one of the most powerful appeals of Cambridge 105 is that the issues discussed are locally relevant and personal to the community. The station’s leaflets even say: “We are local. We live and love Cambridge.” The station has shows which are particularly popular with their Cambridge listeners, share local news and even once helped a local pet owner to find a lost cat. Listeners are often invited to request songs and dedications via text message which are relayed to the relevant DJ. Using the FrontlineSMS as a “back end” (i.e. DJs do not need to directly enter the application), Cambridge 105 have designed a unique system in order to ensure messages reach the appropriate DJ. They have developed a customized PHP script, which is used to create dynamic web-based content. This is synchronized with Google Calendar containing the DJ schedule. When an SMS reaches FrontlineSMS, a query based on the message’s time stamp is sent to the calendar which works out the corresponding e-mail of the DJ who is on air. The message is then forwarded to the DJ in their email account using a http trigger and presenters can access the content from the studio computer while they are presenting. By widely publicizing the contact number for the station, the station is also looking to increase participation from audiences, particularly so that those without smart phones (about half of the UK) can contribute to their favorite shows while on the move. Axel pointed out the notices displayed in the DJ booth and around the station, which explain how audiences can contact the show. These notices serve as a reminder for DJs that they must remind audiences of ways they can participate and interact, and Axel stressed the importance of repeating the number throughout the show (not just the beginning and end). It is especially important for community stations to be able to learn about their audience so that they can tailor their programming towards their listeners’ concerns. The station manager at Cambridge 105 is interested in analytics around interaction. Being a digital form of communication, SMS is a great way to monitor this and offer metrics to advertisers. Advertising is important for the survival of Cambridge 105 who offer local sponsorship packages targeted to a potential audience of 150,000 Cambridge based customers, making it an effective marketing medium. Moreover audiences don’t feel advertising is an invasion as messages more likely to be targeted to their local needs. Axel observed that FrontlineSMS software offers both a flexible back end which can be customized for their specific needs, while also permitting presenters to collect useful feedback and information from their audience in a simple and unobtrusive format. You can find Cambridge 105 at and even listen online. We recently spoke with Dr.Mohammad Anwar Jamili, Faheem Azami and Gordon Shettle from Equal Access, who are working on a project with 30 FM radio stations in Afghanistan to explore how FrontlineSMS can be used to enhance radio programming and engage local communities in discussions on social change. Equal Access specializes in communications combining the power of media with community mobilization, and interest was sparked amongst our community following a recent blog post introducing another of their radio projects in Chad and Niger, Africa. The focus in this post on Equal Access’ work in Afghanistan demonstrates a rich diversity in approaches to using FrontlineSMS in combination with radio, and shows the unique solutions set up by different projects around the world. After 30 years of war which began in the 1980s, the communications infrastructure in Afghanistan was virtually destroyed, and the country’s natural geographic and cultural isolation prevented marginalized groups from receiving critical information. Following disruption caused by war, the country has recently begun to see improvements in many sectors; media being one of them. In the space of the last 10 years, radio stations in Afghanistan have grown from just one to 170 and there are now 50 TV stations. This speedy growth, however, has also brought problems as services have emerged which lack some capacity and professionalism. Equal Access is working in Afghanistan to close this gap in radio stations to empower them with new skills and assist them to harness technology. Equal Access has been based in Kabul since 2002 working with 30 FM stations throughout Afghanistan. They have estimated their reach across various networks of broadcast networks through both local FMs, and national broadcasters with regional repeaters to be approximately 10 million. This wide reach is down to the access of the communications channels they are utilising; though most families will not have TV, almost all families in Afghanistan will have access to a radio and a phone. On Equal Access shows, radio presenters regularly ask a question to their audience and invite SMS feedback by announcing a number whilst on-air. Topics which are covered range from human rights and women’s issues, Islamic education, health and hygiene, drug demand reduction, elections and civic participation, rule of law and peace building. Most recently Equal Access got a lot of SMS feedback from a drama series that was produced for a media development project. The aim was to raise the awareness of the purpose of journalism, and some of the challenges that journalists face. Each program got up to 100 text messages per episode, and FrontlineSMS has proved to be a useful tool to manage the incoming text messages. Gordon Shettle who is working on the project for Equal Access says “SMS has provided us with a window into the listener who has the interest to interact with a program; it allows us to see what issues people are most expressive about.” Use of SMS by the radio stations allows listeners to send in short answers in Pashto and Dari using the Persian script, facilitating grass roots engagement and community participation. Literacy in Afghanistan is very low - the national illiteracy rate in some areas is over 70% and locally produced radio programs have proved to be an effective way to educate and engage communities. If presenters get particularly interesting feedback via SMS they’ll often arrange a call back so speak to individuals on the show. Contributors are also added to contacts records and groups to assist with communication over time. To stay updated on Equal Access’ work in Afghanistan and in other contexts visit their website. To stay updated on FrontlineSMS:Radio software development keep an eye on the FrontlineSMS:Radio blog. Earlier this month, Amy and Peter from the FrontlineSMS:Radio team based in London, UK made the short trip north to Cambridge to meet the University’s researchers at the Centre of Governance and Human Rights (CGHR). In this post, we share an update on the trial of FrontlineSMS:Radio and research being carried out with Breeze FM, Zambia and Radio Buddu, Uganda. In 2012, the Cambridge Centre of Governance and Human Rights (CGHR), as part of its project on 'New communications technologies and citizen-led governance in Africa’ (2010-12), is piloting Africa’s Voices, a collaborative platform aimed at enhancing debate, discussion and knowledge on contemporary issues of public interest in Africa. Designed as an African-wide research initiative, Africa's Voices is aimed at analysing citizens' opinions on a wide range of issues as radio stations all over the continent ask a monthly question and audiences are invited to reply via SMS. Stations are then provided with comparative analysis and can create innovative broadcasts that put their communities’ views in an pan-African perspective. Researchers have recently visited Uganda and Zambia working with local radio stations who are getting ready to ask audience questions. This research will lead to comparative findings on how SMS is used by listeners to discuss issues which affect their community. Sharath Srinivasan who has been working with presenters in the studio at Breeze FM, Zambia reported that one 45 minute show - based on the role of the police and community in arresting criminal suspects - attracted 60 incoming SMS's and generated a very lively debate. The DJs have been testing FrontlineSMS:Radio’s "shows" function for the first time. Shows are designed to be a space where different presenters can organize their own area within the FrontlineSMS:Radio system. By clicking an “on-air” button, all SMS received from that moment on are fed into the current show, making it easier for DJs to organize messages relevant to them. DJs can click "off-air" when they finish so messages are filtered to the main inbox or another DJ's show. With the awareness that many stations have volunteer staff coming and going, this FrontlineSMS:Radio function is designed to be simple and not restricted to user names or passwords. Meanwhile, Florence Brisset-Foucault has been at Radio Buddu in Masaka, Uganda, where they receive around 30 text messages per day and are trying to develop their use of SMS. The most popular topics for interaction from the audience seems to be shows on domestic and personal problems. Presenters are enthusiastic about the future for FrontlineSMS:Radio software especially since they previously relied on a premium rate number. A shift to using FrontlineSMS means they can use a local number, reducing the cost for listeners to text the station by 50% or more. Previously people would pay 220 or 250 sh to text the station but now it will be 110 sh or 50 sh if on same network. (1 £ = 3900 sh). ﻿"FrontlineSMS:Radio makes it much cheaper for audiences to interact with us and we hope it will increase access to our debates," Pascal, Radio Buddu's head of news told Florence. Pascal is confident this will enlarge the number of people able to contact the station and share their views. Another new FrontlineSMS:Radio function is polls, which allows stations to ask listeners to respond to a question using a keyword followed by a letter denominating their answer. When messages are received, FrontlineSMS generates a visual representation in a graph and introduces a system to cope with misspelt keywords through a manual override function. Umar, the programme manager is very excited about the polling activity which he thinks will have great potential particularly in Radio Buddu’s development and health programmes. With a smile, Umar observed that "the polling function will definitely help those of us who are bad at maths, as it displays the results automatically! It will make things easier to announce the results live on air". To find out more about Africa's Voices see their website or check them out on Facebook. You can also hear Hassan Korona of Radio Gbath, Sierra Leone's promotion audio for Africa's Voices here. For more photos from Radio Buddu see the online album.